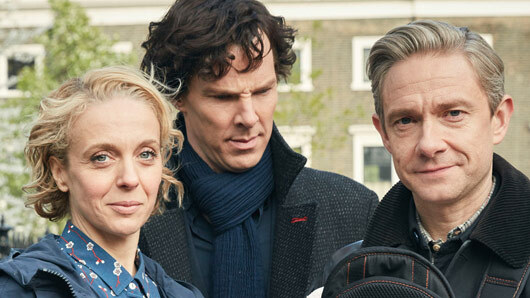 The name of John and Mary Watson’s baby in Sherlock has been announced. Sherlock fans have already been treated to pictures of John (Martin Freeman) and Mary’s (Amanda Abbington) newborn child. However, details about the baby’s name have been kept a secret until now. Now that’s a seriously cool bit of marketing. “Always on his phone”…? Hmm. What could this mean? The BBC dropped an intense new trailer last weekend and now fans are more excited than ever for the new series to commence. Sherlock is set to premiere on New Year’s Day at 8.30pm with ‘The Six Thatchers’. The following episodes will air weekly, with the second titled ‘The Dying Detective’. Sherlock is expected to air at 8.30pm on New Year’s Day on BBC One. « The Only Way Is Essexmas spoilers: Why do Gemma and Bobby fall out and who’s feeling lonely this Christmas?